That was odd because earlier it was formatted with FAT32 and seemed to be working normally (copied files to it). 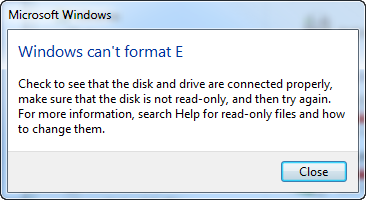 Luckily, I didn’t have anything important stored on it, clicked Format disk and was the presented with the format options and selected Start. 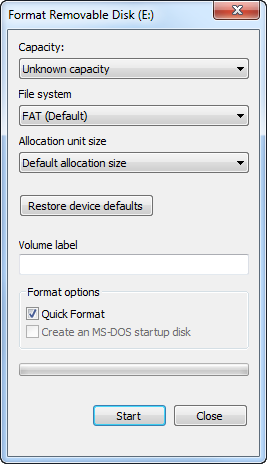 Now we can format the USB stick with with a file system from the GUI or with diskpart using the format command. This entry was posted on June 11, 2012 at 5:08 pm	and is filed under Troubleshooting, Troubleshooting Tools. You can follow any responses to this entry through the RSS 2.0 feed. You can leave a response, or trackback from your own site. hi i have done as said but how do i select the usb +it comes as volume 4 G REMOVEABLE with 0 on size ,it it a 16gb so any ideas wld greatly used . Thanx a lot I’m a final year I.T student but this I ddnt knew. Can you help me with my problem? I already followed all the steps,..and in the end can finally see the file system from the GUI of it,..but then I actually got a little excited, coz I thought I have finally fixed it and then I plug off the external hard drive I’m fixing and I forgot to format it before removing it,..so I plug it in again and my problems got worse,..it all comes back to zero so I started trying to do the steps again, but I never saw the file system from the GUI again so I tried to format it using the cmd command prompt but it didn’t work so I tried to use the command CLEAN in the cmd after using CLEAN command it say’s that the hard drive is now UNINITIALIZED,..i tried to do everything i could but it didn’t work. whenever I am plugging in my hard drive in every laptop or computers it didn’t show up or even pop up a notification that it is already installing a new hardware,..i can’t even find my hard drive in “my computer” folder,..the computer is not reading it. why? I’m sorry I just got a little confused at some point,..can you help me please,..Thanks! hey looked i have a kingston data traveler 111 32 gb and it has somehow lost its partitions but everytime i try following your guide when i get to creating the partition i get an error and that i can look in the log to figure out more,?? it won’t let me create a new partition? can you help? Hi, Nice writeup. I have 1 problem. Hope you can give me some hints. same is the problem with mine too. please help me. While checking the partition as “D: list partition” the list of index is showing of Diskpart eq:- ADD – Add a mirror to a simple volume, ACTIVE – Marks the current basic partition as an active boot partition….etc…. it says “the parameter is incorrect” what do i do? first guess is the file system is borked. Verify it is formatted, if not, format it (you will loose any data on it but that may already be a given). I couldn’t get it to delete the volume or the partition. Once I selected the disk, however, I was able to use the “clean” command and voila! You must be in elevated command prompt before you go into diskpart also. You are really good at it! Thank you so much, my disk is now fully recovered. Thank you so much for this article. I have been searching for answers and can’t believe it was this easy. I tried to follow your steps in repairing my usb drive, but instead of the status presenting itself as unusable, it is healthy. However, the file system is listed as RAW. When I attempted to create a partition primary, the cmd said that I couldn’t because no free space could be found. Some background regarding the usb, it was originally FAT32 but I formatted it to NTFS so that I could put a 4.15 GB video on it. Everything went smoothly, and I played the video on my television, but then when I turned the tv off and on the usb could not be found. When I plugged it back into my computer, it had changed to a RAW system and displays 0 bytes of room. I’m unable to format or do anything to it. I’ve tried checking it for errors and not had any success. I was wondering if you might be able to help me as you put together this great guide for a similar situation! Volume 7 is the selected volume. DiskPart has encountered an error: Incorrect function. Thank you! I was doing everything right except I didn’t know I needed to make the partition first. I was about to give up on my 128gb stick! DiskPart has encountered an error: The parameter is incorrect. I don’t know what to do next? wow i just followed your guide, excellent by the way, but I still cant confirm it worked for me because i used diskpart for formatting also, but wow that way is slow… I guess its writing ceros all over my usb drive..
I’m an idiot that though I destroyed my new 128 GB stick by messing around with it. Thank you for negating my idiocy. thank you so much.nice work.